The Dell Inspiron 7567 tries to be a lot more than just a gaming laptop and achieves some of it. It has amazing battery life and is well suited for AAA gaming titles. An Intel Core i7, 8GB or 16GB of RAM and the new NVIDIA GTX 1050 (Ti) GPU. These are bare minimum specifications a laptop should have if it wants to be listed amongst gaming laptops. Moreover, having a red and black paint scheme has almost become a necessity these days. 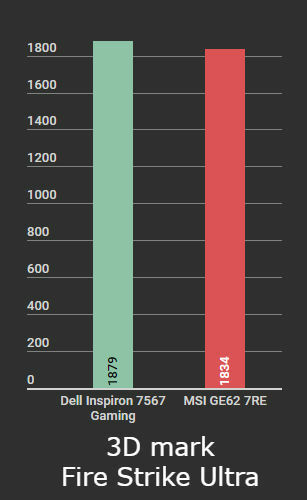 The new Dell Inspiron 7567 Gaming does all that and a tad more. Don’t get me wrong, it is still an entry level gaming machine, toting a NVIDIA GTX 1050 Ti, but at the same time has a battery life to shame some regular laptops. On paper, the specifications perfectly match-up against the newly launched HP Omen and similarly powered offerings from Asus and MSI. However, since this is a Dell PC, I was expecting a lot more sensibility under the busy exterior. The Dell Inspiron 7567 gaming brings back the whole red and black theme it had the last time in a new and amplified manner. 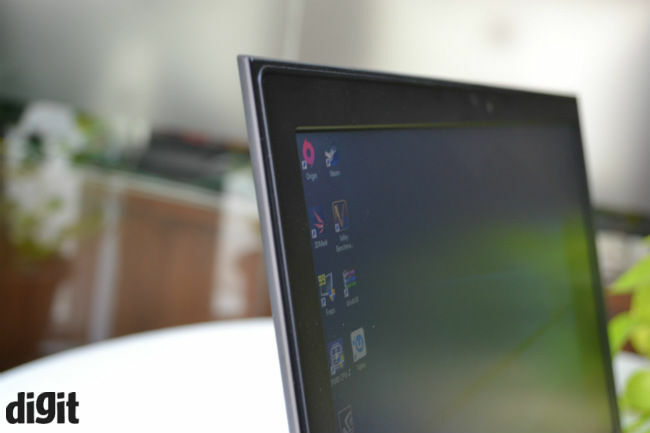 The laptop has an odd yet intriguing mixture of curved and sharp edges. It still has a plastic body draped in a matte finish, but it is unlike anything I have seen in Dell’s Inspiron range of laptops. On the other hand, it’s not angular or RGB ridden enough to lie in the Alienware range either. Its curved sides and sharp front and rear put it somewhere in between the Inspiron and Alienware ranges, which is perhaps what Dell is going for. It’s uncomfortable to hold like a normal laptop (horizontally), but still, that is what makes the design unique and in the mind of the gamer, that matters. You still get the red on black logo on the lid, with red exhaust grills. Also, there are only two exhausts this time and both are at the back. Dell has also incorporated a new mesh-like design on the exhausts, which is continued at the front with a slightly altered pattern. The biggest change however is in the display hinge, which takes cues from the Lenovo Y700 and features a single hinge, instead of the dual side hinge. While this new hinge looks cooler, giving the display a floating look, it is not as sturdy as we had hoped. 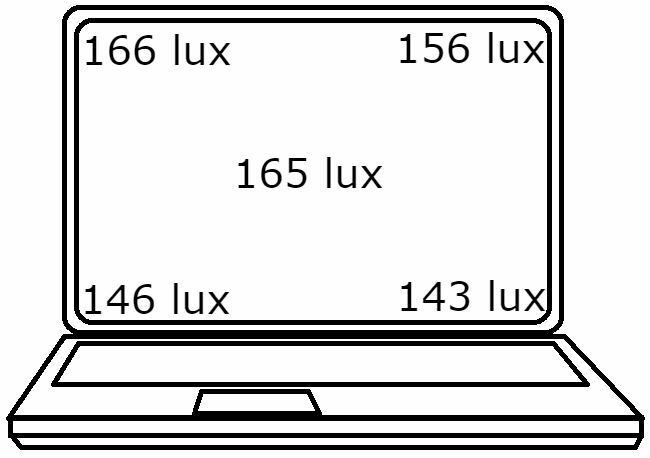 There is a decent amount of flex in the display and since the lid holding display is not very thick, it may end up being damaged. I should also mention that Dell has fixed the flex issue on the keyboard this time. Dell has provided a maintenance hatch on the laptop like last year, which is much appreciated. It can easily be opened by removing just a single screw. Once removed, you get access to the RAM, Storage, Wi-Fi module, CMOS battery and even the 74Wh battery. Good thing is, even if you upgrade your memory, you will still get limited warranty. 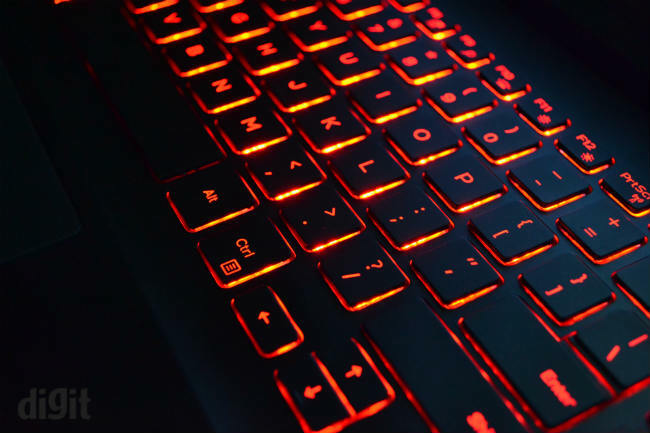 A gaming PC should offer tons of connectivity options and while Inspiron 7567 Gaming does have a long list of ports, which will satisfy your immediate needs, there are some things missing here. 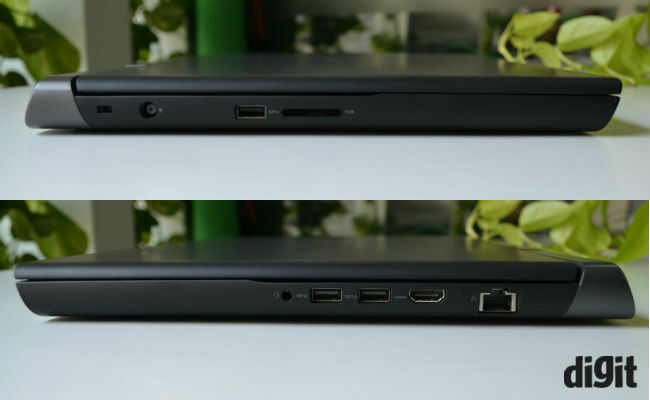 So, on the left side you have a power port, a USB 3.0 port and a microSD card slot. On the right, you get an ethernet jack, one HDMI-out, two more USB 3.0 ports and a microphone/headphone combo. The laptop misses out on a USB Type-C port, which would have helped users hook up newer displays or better GPUs (external GPU), if required. While I have small niggles on the build and I/O front, I am truly disappointed with the display here. 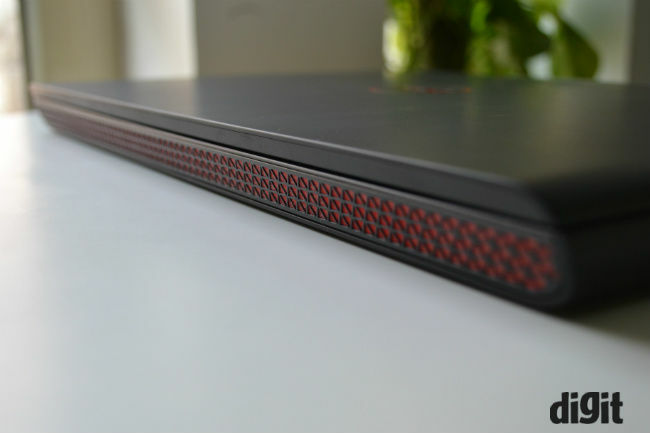 While Dell is indeed placing this as a budget alternative to the Alienware lineup, the 1080p TN panel used here doesn’t do justice to the laptop’s gaming capabilities. Being a TN panel, the display only looks half decent when you are watching it head on and viewing angles are simply poor. Colour reproduction as well as contrast are far from accurate, and there is a persistent bluish hue on the display that makes your viewing experience somewhat annoying. Dell does provide the TrueColour software, which is supposed to make the colours better, but that does not solve the issue either. 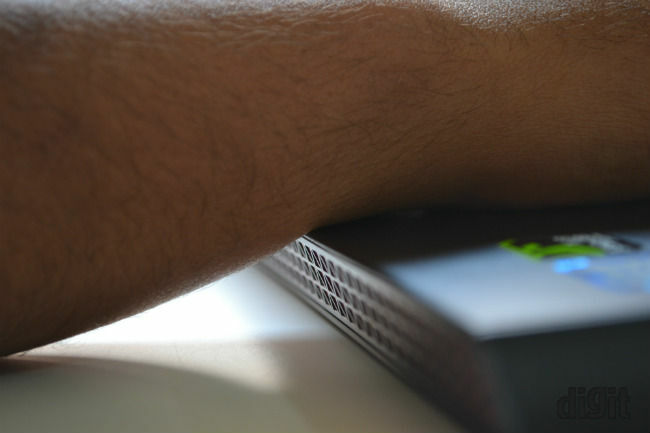 There is little to complain about the Dell keyboard and touchpad used on the new 7567 Gaming. It is pretty much the same setup as last time, with an island style keyboard layout and numeric keys on the right. While I wanted to see macro keys on an entry level gaming machine, but seems that’s a farfetched idea right now. As for the keyboard itself, it is a similar offering as last time. It has decent key travel of about 1.5mm and has a consistent actuation weight across the keyboard. Now, some gamers and touch typists may find the key travel and the lighter actuation weight a little annoying at first, but I reckon, people will get used to it. Adding to the typing experience is the backlit keyboard, which now has two step lighting, a plus point for the laptop. 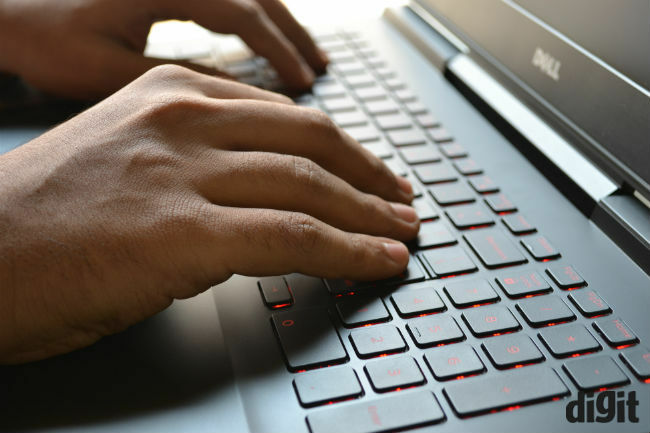 However, long typing or gaming sessions will be hampered because of the sharp edge of the keyboard deck, which really leaves marks on your wrists. The touchpad on the other hand has a new rough texture to it, which does not feel as good to touch as one with a matte finish, but works surprisingly well. 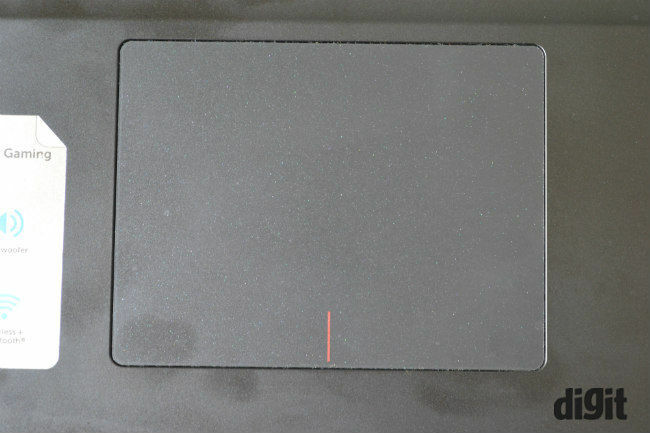 The touchpad recognises most touch inputs and handles all primary Windows gestures well. Like its previous iteration, there are no separate left and right keys. However, the two keys are a little soft to press, but precise and click with an audible sound. Our test unit is powered by an Intel Core i7-7700HQ processor, clubbed with an NVIDIA GeForce GTX 1050 Ti GPU. This gives the laptop enough power to punch through every triple AAA title without any issue, even with high and ultra settings. 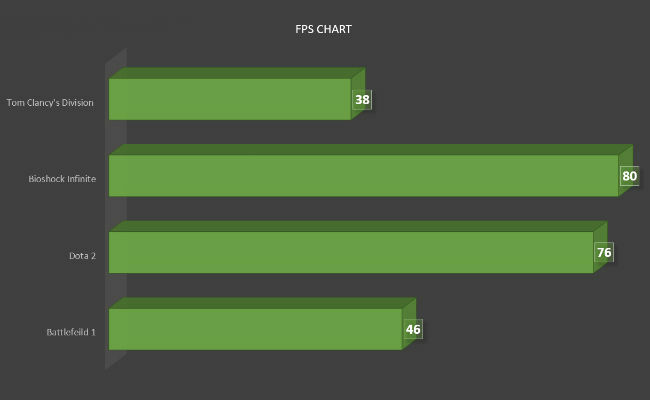 While running Battlefield 1 at Ultra settings, with DX12 enabled, the laptop consistently managed to produce an average of 46 fps, which is remarkable. More popular titles such as Dota 2 ran consistently above 72 fps at extreme settings. It was only when I tested Ubisoft’s Tom Clancy Division at Ultra that the fps counter dipped below 35fps. Older classics like Bioshock Infinite will happily run at 80 fps average on high settings, with the fps counter hitting well above 220 fps at times. This just means that now even entry level gaming GPUs can handle newer games at 1080p, that too in higher graphic presets. I reckon with so much power, this laptop should serve you well for at least 2 years, but you may have to lower the graphic settings down to medium to get the most out of it after that. Gaming aside, this laptop is a beast at multitasking. I ran a handbrake test, with large mixed media files being copied on the system, along with multiple browser tabs open, with one of tabs streaming audio via SoundCloud and everything worked fine. The 16GB of RAM is ample for like editing videos as well. As for the storage, our test machine packs a 256GB M.2 SSD from SanDisk, offering decent read and write speeds. Along with that you get a 1TB Toshiba hard drive, which at 5400 rpm is a little slow, but does handle the role of a secondary drive well and is large enough to store your large game libraries. 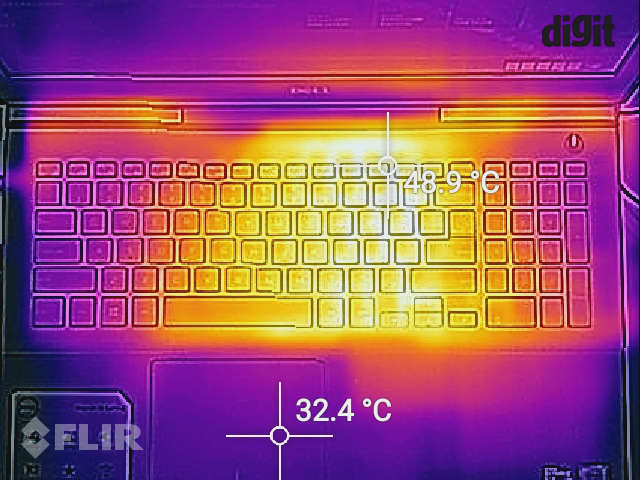 Even with a powerful setup like this, the Dell 7567 maintains heat quite well and the max temperature I recorded was 51 degree Celsius in the middle of the keyboard. This makes the keyboard a little warm while gaming, but nothing that would put you off. 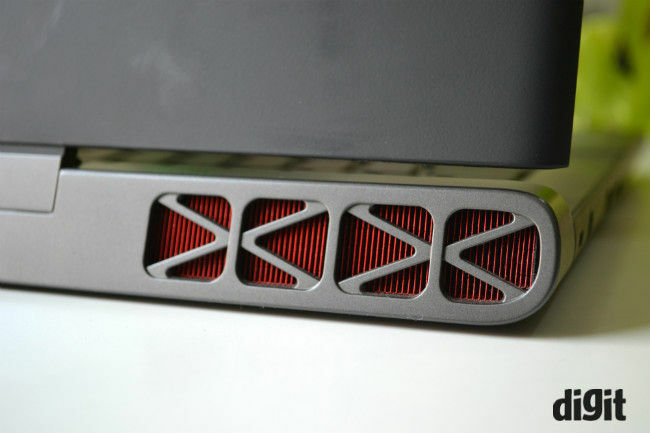 Noise levels are in check and the two fans only go loud infrequently during gaming. If you are just surfing the web or writing in Microsoft Word, which by the way comes free with the machine, one can barely hear the fan spin. Lastly, we need to talk about the battery, which takes the cake here, in my opinion. 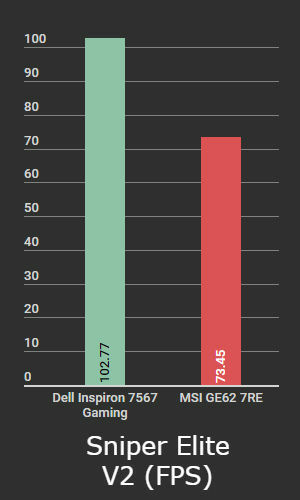 The new Dell Inspiron 7567 Gaming lasted me over 10 hours of use in day-to-day work, like browsing and office work. Even when I tried to drain the battery by streaming HD videos on Netflix, the laptop still lasted me for over 7 hours. Even when we talk about gaming on battery, I was able to get 4 games of Dota 2 out of the machine, meaning just shy of 4 hours of gaming on battery, which is a huge deal. 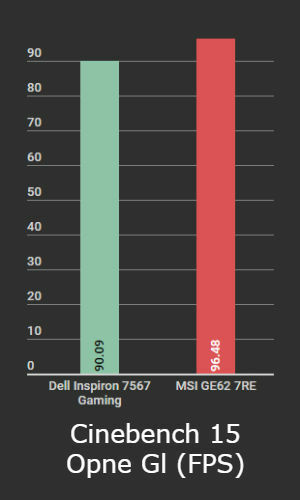 On PC Mark’s work battery benchmark with 100% brightness, the Dell Inspiron 7567 Gaming scored 4 hours 53 minutes. 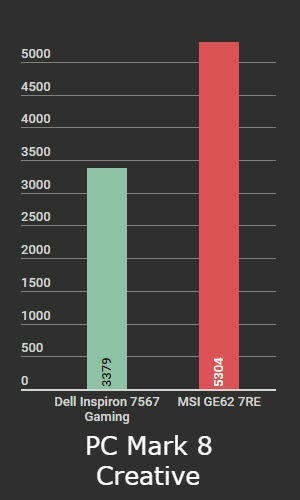 In comparison the MSI GE62 7RE, which has a similar set of specifications lasts for about 2 and half hours. This not only sets a high benchmark for all future gaming laptops, but blows the current competition out of the water. The Dell Inspiron 7567 Gaming is in essence an all-round gaming machine, or at least it tries to be. Yes, the performance is exciting and battery life is the best I have ever seen on a gaming laptop. I personally won’t go for this laptop as the display just takes the life away from the games you play on it, but if you can overlook that fact, this a laptop worth buying.